Probably the first thing that strikes the visitor as "different" is the scattered groups of giant, white/green pyramids seen near St. Austell; or noted by motorists after passing the Bodmin Bypass on the A30. These are the mounds of waste material extracted during the process of refining China Clay : that pure white, velvety substance, the production of which is not only a principal industry of the Duchy today, but is also one of our most important exports to the dollar countries. China Clay (or Kaolin) is, in simple language, highly decomposed granite, rotted by the action of water. The outstanding properties of this substance as a potter's clay were first appreciated by the Chinese - who have employed it for thousands of years in the fashioning of their best porcelain. 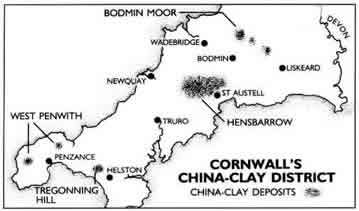 The discovery of China Clay deposits in Cornwall was made in 1755 by William Cookworthy, a native of Kingsbridge, Devon. Its particularly fine quality was quickly recognised by British pottery concerns. Many years later it was put to additional uses playing an important part in numerous manufacturing processes, including the making of paper, cotton, linoleum, chemicals, face-cream, shaving-soap, paint and as a base for certain medicines. With the exception of China, Cornwall enjoys almost a world monopoly for the highest quality, pure white Kaolin, and the demand exceeds the supply. China Clay is obtained from open pits by directing on to the sides powerful jets of water which wash away everything in their path. 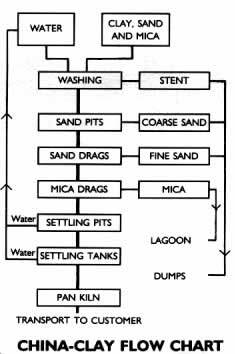 The clay together with sand, stones, etc., is carried to the bottom of the pit. After repeated washings the clay is separated from the waste, and is then pumped up to the "Micas" on the surface, where it undergoes further washing and filtering. The resulting waste is conveyed to the top of the burrow and tipped out by special apparatus. Separated, finally, from every trace of sand and impurities, the clay is removed to the "dry," a long, one storied building with a furnace at one end and a tall chimney at the other, by means of which the floor is heated and the surplus moisture extracted. The clay is loaded into railway trucks or lorries for transport to Fowey or Par for shipment abroad or directly to markets in the UK. Some of the older pits are of considerable size, extending to 300 feet in depth and up to a mile in circumference. For every ton of pure clay recovered roughly five tons of waste finds its way to the top of the burrow. This waste, consisting mainly of quartz and sand, useless to the industry, now forms the basis of certain types of concrete and building blocks. China Stone contains quartz and, although a good building stone, its main use is in the production of glaze for facing earthenware. Charlestown is a tiny port which secured by right of proximity a considerable part of the shipping business of the Clay Country. Its single small dock was busy with vessels of the smaller classes: steamships loading China Clay in bulk, grimy little colliers discharging coal, or occasionally a stately Scandinavian sailing ship landing cargoes of the sweet-smelling barrel-staves destined to become the casks in which the finer qualities, or small quantities, of China Clay were transported. Charlestown is no longer used for the transport of China Clay. 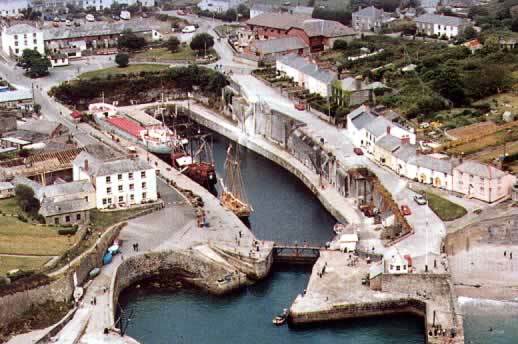 Now it is a privately owned Harbour Museum much used by film-makers and open to visitors between March and November. The old clay workings too have modern day uses. One famous example is the construction of the World renowned Eden Project in an old clay pit near St Austell.